A thermal insulator is a material that does not conduct heat well. By minimizing heat energy transfer from one material to another, insulation prevents heat from escaping or entering an enclosed area. Cotton balls are good thermal insulators. The air surrounding and within cotton fibers makes cotton balls good insulators. Heat moves through some materials better than others. Dense materials are good conductors because they consist of tightly packed atoms capable of efficiently transferring energy from one atom to the next. Less dense materials make better insulators. Consequently, gases insulate better than liquids and liquids insulate better than solids. 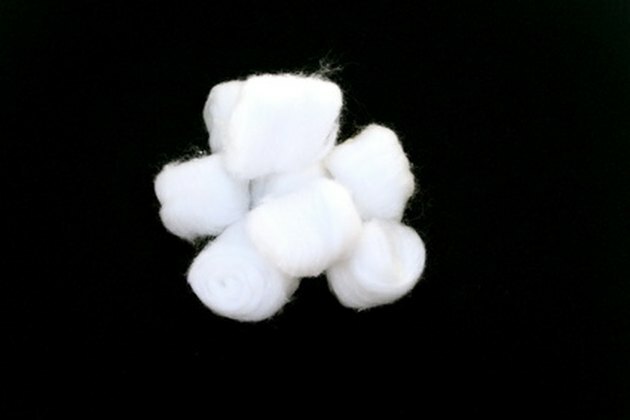 Cotton balls contain individual cotton fibers. Air within and surrounding the fibers make cotton a good insulator. When cotton gets wet, it loses much of its ability to prevent heat loss because the air spaces fill with water, a material that transfers heat more readily. A material's R-value indicates its resistance to heat flow and determines how well that material insulates. The better the insulator, the higher the R-value. According to Build It Green, a non-profit organization dedicated to promoting energy-efficient construction, cotton insulation has thermal properties similar to fiberglass, a material commonly used to insulate homes. Cotton R-values range from 3.2 to 3.7 per inch. Since R-value is proportional to material thickness, doubling a material's thickness doubles its R-value.